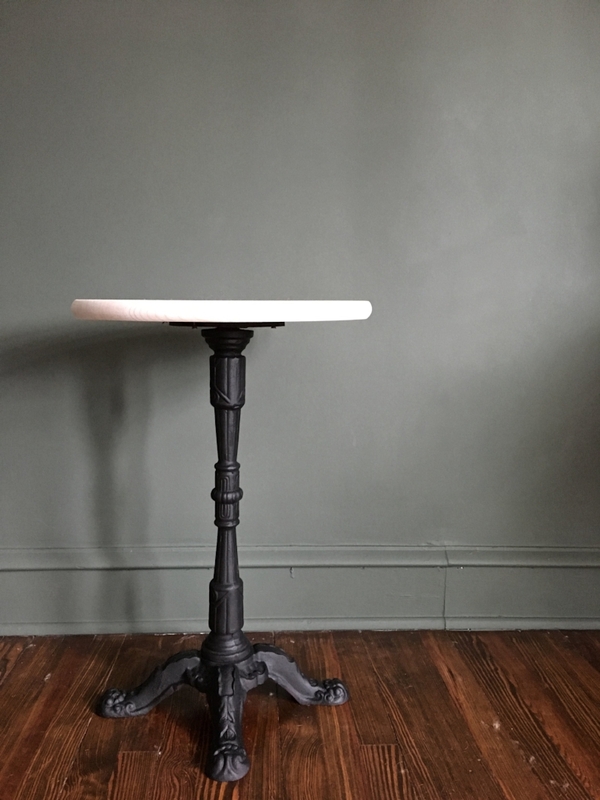 I’m sitting here writing this post in the wee hours of the morning in our new green velvet chairs with my feet propped up and a warm cup of coffee in hand, feeling so close to finishing this room (I’m fooling myself really). This is the last week before the reveal and if you’ve been following along through Week One, Two, Three, and Four, you have seen this room go from bold and bare to layered and cozy. Despite having a full list of things to accomplish before the upcoming photo shoot, some things did take place that are making a big impact on the room and helped me see that there is a light at the end of the tunnel! First up, the rug for the sitting area came in! This immediate warmed up the space and rather than have one large rug that would take up the entirely of the room (and my budget), I opted for to separate, but coordinating rugs that will define the sleeping and sitting spaces. I happened upon this one from Overstock while perusing the internet one day and I thought to myself, “wow, that’s really pretty, I wonder if it looks that good in real life".” In addition to rug shopping being difficult for me in general (I think I have looked at thousands of them for this room already), I am always doubtful when purchasing textiles online as the colors generally aren’t well represented. I took my chances on this one though, because I thought if it really was as good as it is online, it could be a winner. I wasn’t disappointed. 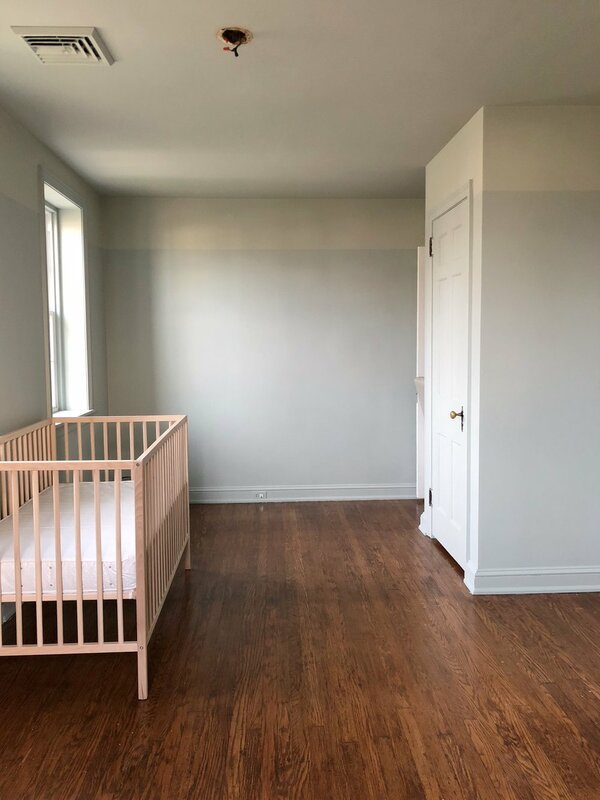 It appears almost exactly as pictured and has the perfect muted tones and texture that I was looking for and tiles in with some of the blues and pinks in the fireplace tile. Hooray for small victories! While I still have a second coat of lime wash to put on the walls and a second coat of trim paint, I couldn’t resist getting started on painting my window sashes black (#instantgratification). I spent a few nights this week putting on the first coat and I love how it’s changed the feel of the room immediately. I have dreamed for years of having black window sashes, they are so striking, and these old windows were the perfect opportunity to try out this concept. I will be doing some scraping of the old white overpainting on the edges to hopefully clean them up a bit more and getting the second coat on over the next few days. I’d love to clean up all the painted and brass hardware on them as well, but time may not allow for that, I’ll wait and see. Another exciting development is the arrival of our coffee table for the sitting area! Since there are so many traditional elements in the room, I knew I wanted something modern for the table and I came across this awesome piece from Hayneedle. I also thought that it would be great to have something that could function a bit like an ottoman because we’d be sitting in front of the fire and reading in this area and cozy time was of prime importance. The simple form of this coffee table is the perfect complement to the chairs, and I also like how hefty and solid it is because we are definitely going to be propping our feet up (socks only) on this beauty! The piece is sold and has a lovely oak grain and dark stain that coordinates really nicely with our antique walnut dresser. Speaking of, since we finally moved our furniture over here last week, I was able to get the walnut dresser into place and I love how it looks on this wall. We picked up this dresser for $200 years ago when we lived in Florida and we were told it is from the 1800’s. It was in our bedroom in our last house and although we don’t necessarily need it for clothing storage in this room (our closet is plenty big for all our clothing), I thought it could be great storage for linens and extra blankets since our other closets are quite small. I’ve been starting to pull together some of the accessories for the room. This gorgeous mirror from Lamps Plus arrived earlier in the week for above the fireplace. I have ordered numerous lighting pieces from Lamps Plus over the years, but really didn’t have any idea of the breadth of items beyond lighting that the website carried. This mirror was the perfect modern piece that I was looking for for above the traditional fireplace. Every room needs a mirror in my opinion and this one was the perfect combination of simple shapes that I was looking for. Other items include an etching from the 1800’s of New York and a vintage marbleized pottery piece I picked up on my trip to Colorado this past September. I also ordered an original art piece that I have been eyeing for months now from my friend Angela Simeone. I love the abstract, natural flow to the piece and the soft pinks and greens are a nod to the furnishings and carpet in the room. 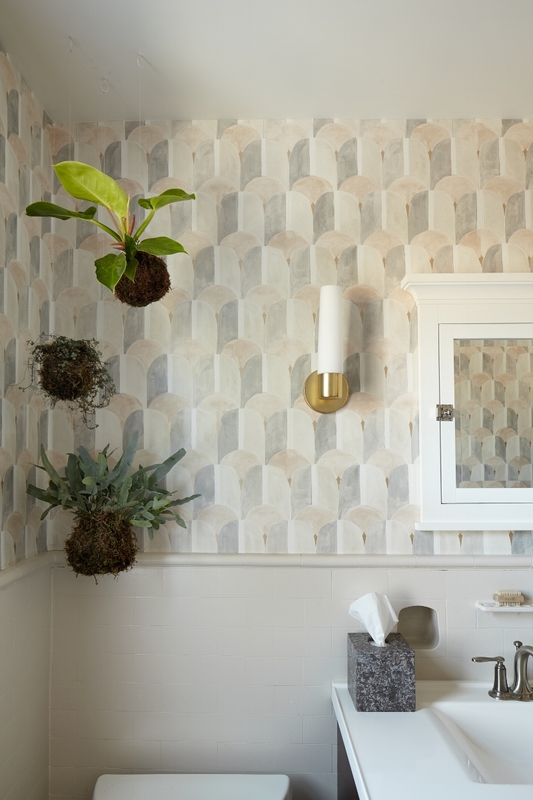 She also just released her first wallpaper line and it’s insanely gorgeous, if you’re considering wallpaper for any of your projects, she has a wonderful variety that would make any space feel special. OK, I’m off to work! As always, I’ll be giving lots of behind the scenes in my Instagram Stories if you aren’t already following along. And thank you all for your heartfelt comments and cheering me on to the finish line, it means so much to me! Hey friends! We’re moving along on the progress in our master bedroom, but let me tell you, it has been slow going. Two big pieces arrived this week, the headboard and the lime wash from Portola Paints. 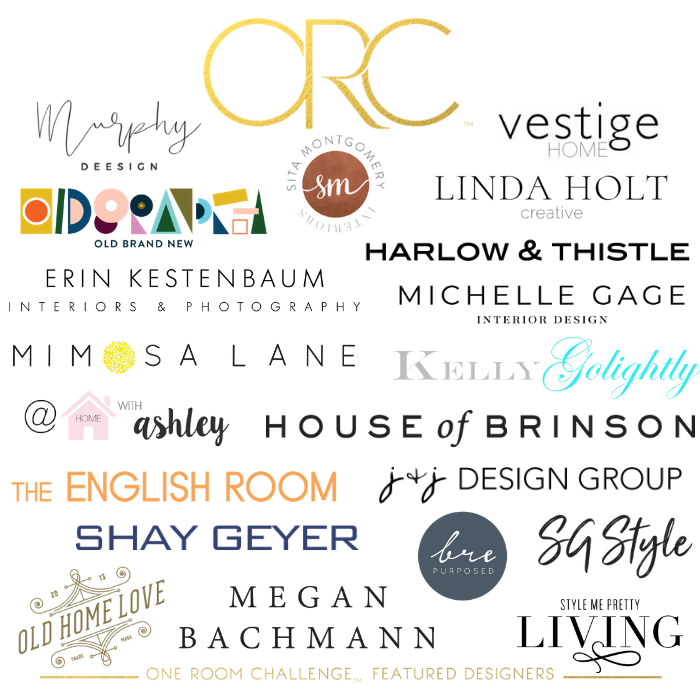 Unfortunately, the timing aligned with me being out of town for four days for the Highpoint Furniture show, which I had been planning to attend months in advance. The paint arrived from Portola Paints on Friday afternoon. I was leaving for North Carolina bright and early Saturday morning, so I headed over to the house to start getting a coat of the primer on because I wanted to get at least a little something done before I headed out of town, Shelby graciously offered her supervision services. As excited as I was for brushing on that yummy lime wash, the first step is to put up the primer, which Portola Paints recommends to help achieve a more consistent appearance and uniform absorption of the lime wash. I’ve primed when I'’ve used the lime wash before and I loved how it turned out, so I’m going with what works. The primer is really thick, and goes on with a roller, which makes for quick work of the flat surfaces. It was dark by the time I finished rolling on the coat of primer, and it was getting a bit late for cutting in all the corners, so this is where I ended up leaving things. I left early the next morning for Highpoint, so these were the best shots I could grab of where things stand. The headboard arrived from Etsy and I’m contemplating the best way to refresh the caning in it. I’ll also be painting the wood black. The shape is really lovely and it’s the perfect height to sit right below the windows. So that’s my meager progress this week. I’ll definitely be hitting things harder this week and will have the painting done in the next couple days now that I’m back in town. If you want to follow along on the progress of the project in more real time, be sure to follow along on Instagram where I will be posting regularly on the progress of the project in stories and my feed. Hello friends! It’s week two and so far I am the most behind that I’ve ever been on a One Room Challenge-ha! Ok, maybe that’s not totally true, but with moving to a new house and an extremely busy work schedule, I’m definitely a little behind where I’d like to be, but hey, I’m just gonna roll with it, because honestly, that’s just about all we can do, right? This week I’m sharing my design plan that I’ve been working on for the last few weeks. I hope you've got a cup of something tasty and a comfy chair, because this is going to be a loooong post, and hopefully a good one! If you're just joining in, you can learn more about the room that I’ll be making over in my week one post. My mission statement for this space is to create a warm, layered space that embodies a sense of time and patina juxtaposed with modern elements. 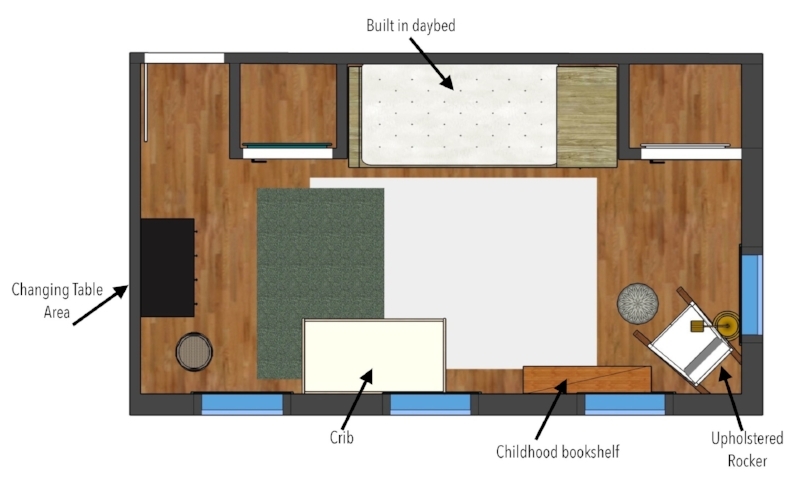 But first, the floorplan, because function is first in any of my design plans. Since the room is long, it makes sense to break it up into zones. As you enter the space, the bed is the first thing you will see through the doorway. `Due to the number of windows in the room, there aren’t a lot of options as to where the bed can sit. I briefly considered putting it on the wall between the entrance and the closet door, but it would really block off the view of the fireplace and I really wanted that to be a focal point in the room. 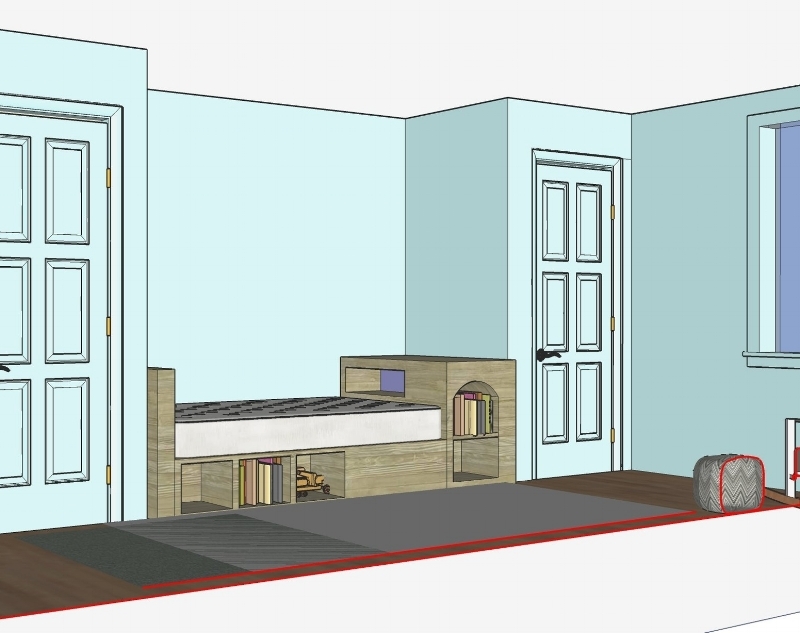 I also considered floating the bed, but that just didn’t seem to be an efficient use of space, and with the king size bed, it really took up a lot of space in the width of the room and left the nightstands and bedside lighting options a bit wonky. So against the wall the bed goes, under the trio of windows, which really aren’t that high off the floor and made finding the right headboard a bit of a challenge. We’ll have a nightstand on either side of the bed, because, we got stuff! Over by the fireplace, we’ll have a couple upholstered chairs, a cozy rug, a coffee table and lighting. I think this will be the perfect place to read before bed as I tend to have a hard time staying awake to read once I curl in under the sheets. Adam and I have started getting up earlier in the mornings for reading and writing, so I think this is also going to get a lot of use at the start of our days. The alcove next to the fireplace was begging for some floating shelves. There’s not going to be a ton of open storage in the room, so this will be a great place to keep a few books and keepsakes, maybe some firewood in the bottom portion and more excuses to feed my ceramics obsession :) My rendering shows this as more of a wood storage area, which I thought would be really cool, especially since we’ll be using the fireplace a ton. After further research and consulting my bug guy, John, I decided against any mass wood storage in the room. The first mention of wood roaches and I was out. In all honesty though, I’m sure you’ve all seen those lovely, stacked wood organizers, and maybe those work if you aren’t bringing in wood from the outside regularly, but it just didn’t seem like it was the solution for us. 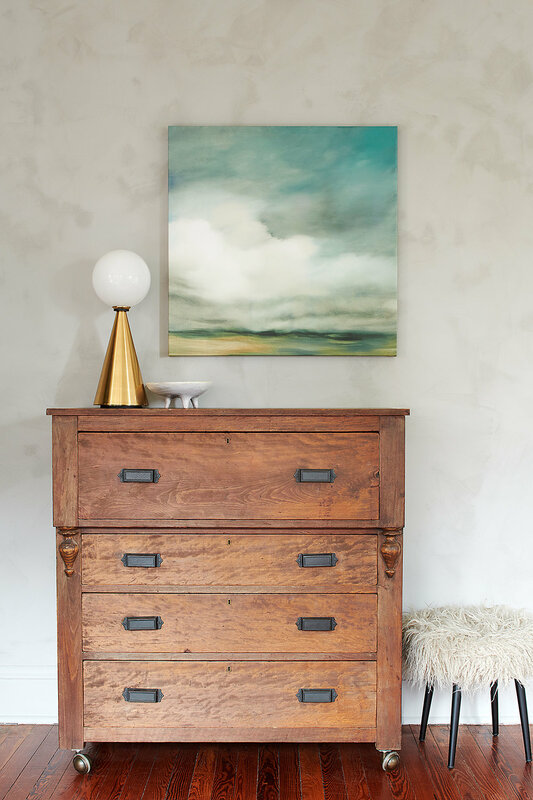 We’re most likely going to be using the antique walnut dresser from our other bedroom because we love it. Just because you’re redoing a room doesn’t mean that you have to put everything new in it. Plus, the walnut will bring some warmth to the room and we’ll still have some good wallspace for a small bench and some large scale artwork. 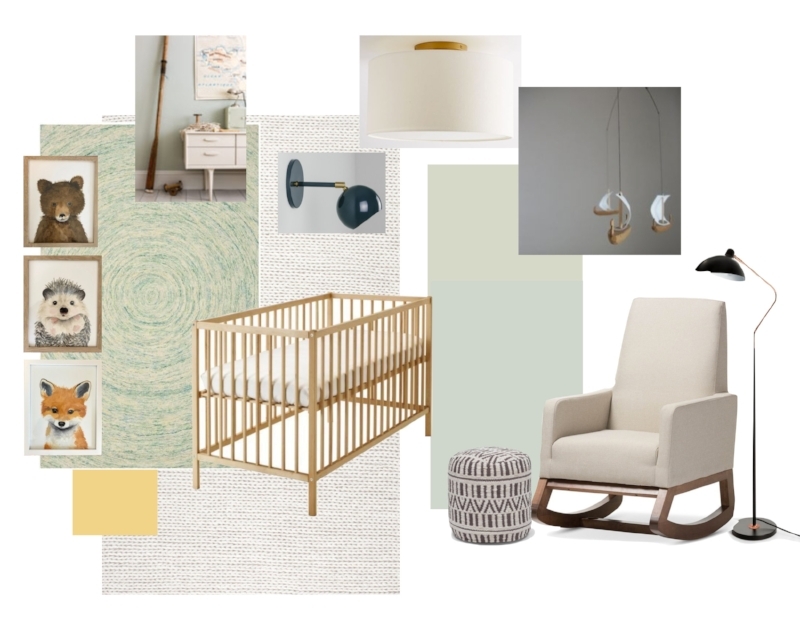 So now that I’ve laid out the floor plan for the room, let’s talk the pretty stuff! 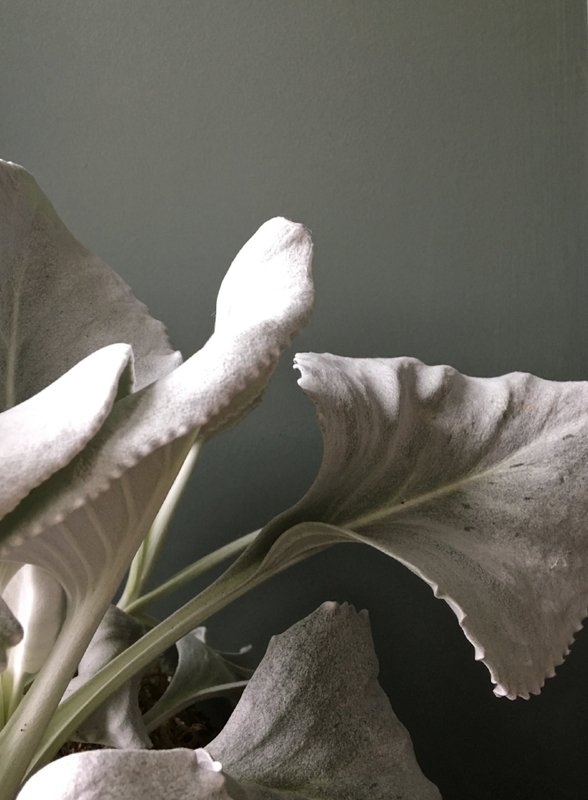 As I mentioned at the beginning of the post, I want to create a warm, layered space that embodies a sense of time and patina juxtaposed with modern elements. 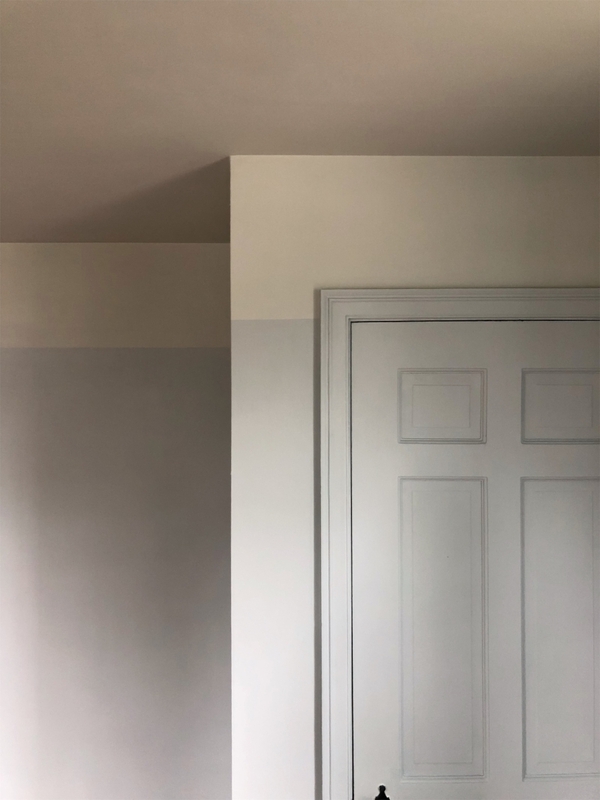 Some of you might remember that I used Portola Paints lime wash in our previous master bedroom (using a colorblocking technique). 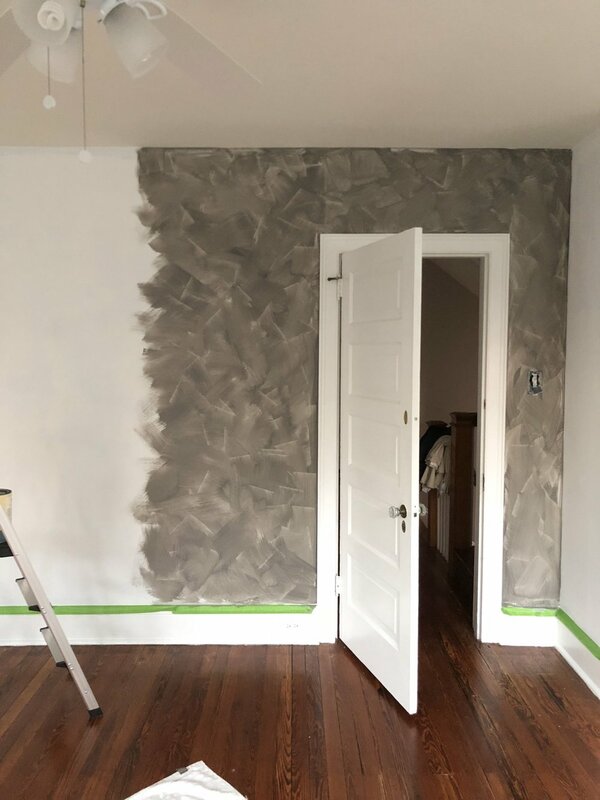 Well, I wasn’t ready to give it up, so when I started thinking about what kind of backdrop I wanted for the space, Portola Paint’s lime wash was at the top of my list. I’ll be going with their North Woods color for the walls and Vintage Black for the doors and fireplace. The fifth wall, soooooft pink. Need I say more? I haven’t decided on an exact color yet because I want to get the lime wash up first and then put some samples up, but I’ll be sure to share when I do. Window sashes are going black, they’re really gonna pop! As with most of my work, I like to mix old and new, and this room is no different. 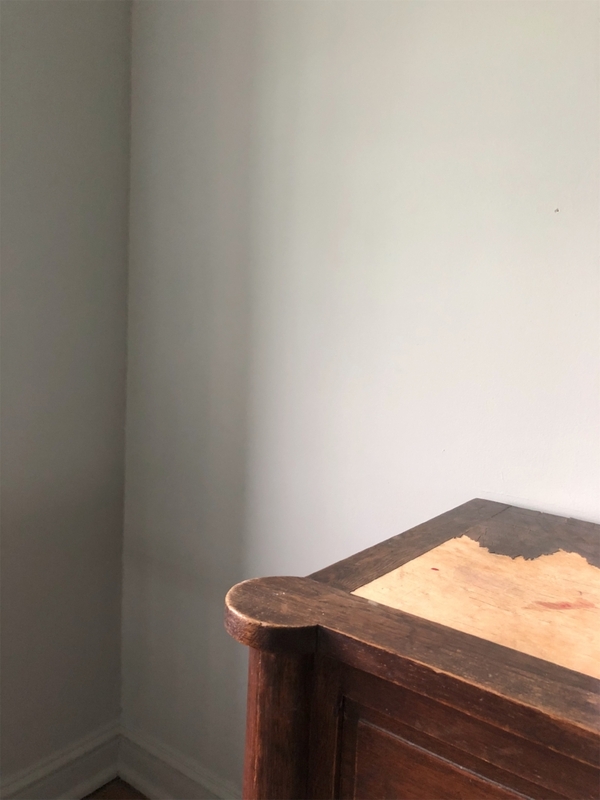 I found a beautiful vintage headboard on Etsy that is the perfect height to fit just below the trio of windows, it has a beautiful, soft curve to it and I’ll be sprucing it up with a new color and fresh caning. I’m a bit limited on what I can build from scratch this time around, so while I would have loved to build a platform base, Hayneedle had the perfect, simple, low platform base that will let the headboard be the star of the show. Nightstands??? Yeah, still working on this one. 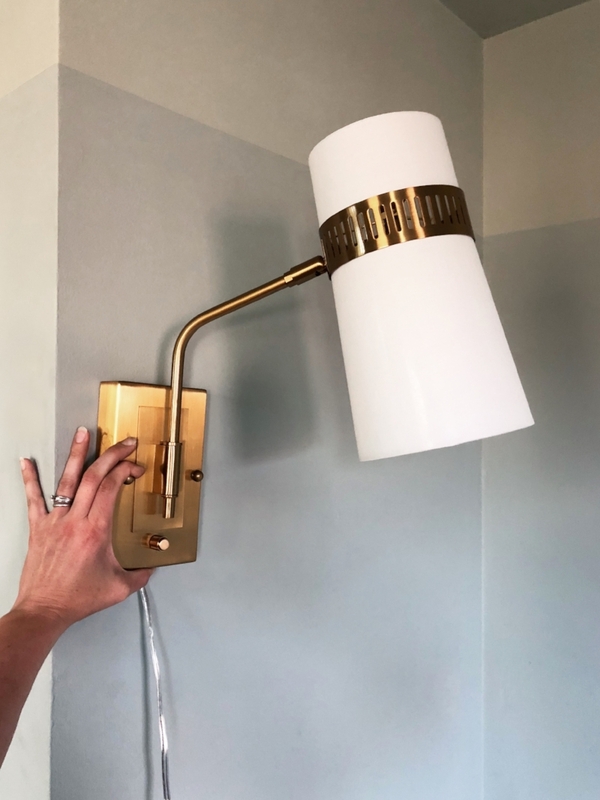 Wall mounted lights are a space saver and these have a beautiful vintage vibe with minimalist lines. I had one of Serge Mouille’s wall lamps in my living room and I have always been a fan of his work. It is the embodiment of organic, modern design. When I was thinking about lighting for this room, I did contemplate putting in another ceiling fan as they are practical, and since we currently don’t have central air, we might be begging for one come next summer. 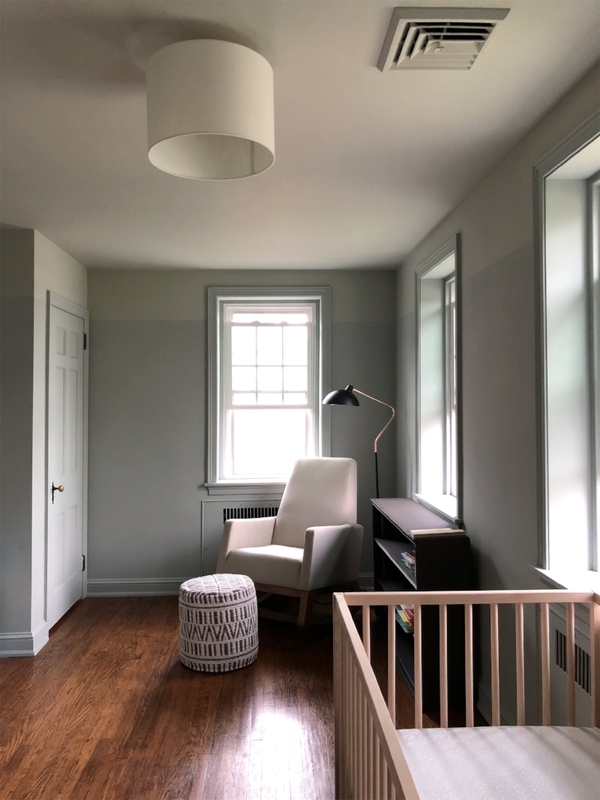 But, ultimately, I thought that this long room needed an equally scaled overhead light fixture, and the long, sculptural arms of France and Son’s Three Arm Lamp is going to be perfect in the space. Over in the seating area, I’ll be using two of these Embrace green velvet chairs from Article, the clean lines give them a more modern feel and the velvet gives a nod to tradition, it’s the perfect mix. Hudson Valley Lighting has the perfect gorgeous brass pharmacy lamp to bring in more of a traditional element and I chose this chunky modern coffee table from Hayneedle, not only because I love the shape, but also because I knew we would need a place to put our feet up and this piece felt substantial and sturdy enough to do so. Adam and I picked out the artwork for the room together and we decided on local artist Kelly Money’s piece from Minted, the colors are so soothing, I can’t wait to wake up to it every morning. Adam, who is an incredible artist himself, was also drawn to Linger by Sarah McInroe, also from Minted. We’ll no doubt be sprinkling in various other items we’re going pull from other areas of the house or find in the next few weeks. Since the furnishings and some of the lighting pieces are a bit more on the modern side, I decided that I wanted to go more traditional underfoot. The room is about 21’ long and using one large rug would be more than my pocketbook could handle. Plus, I hate to cover up too much of the gorgeous original wood floors. So I opted for two separate rugs, complementary to each other. Having two rugs defines each of the zones of the room as well. I am still finalizing which ones I am going to be using, but the vibe of the ones pictured is what I am going for. Roller shades are my jam. Since I am going to be painting the window sashes black and there are so many different types of windows in this room, shades are the most practical solution in my mind. They are clean, simple, and unfussy and will look good throughout, rather than trying to figure out a curtain or valance solution that looks good across the whole room. I’m still deciding on the color, but lemme just say that there might be some black shades in the mix! These ones from the Shade Store are at the top of my list. Whew, so that that’s the plan folks! Now, time to get to work! If you want to follow along on the progress of the project in more real time, be sure to follow along on Instagram where I will be posting regularly on the progress of the project in stories and my feed.